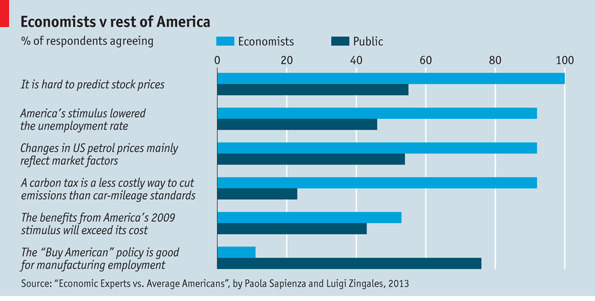 The Economist and Vox each have nice pieces up on what economists do and do not agree upon. To take the second part first, the piece from Vox shows that there is a pretty large degree of consensus on this issues. What this shows is that out of about 80 questions, economists completely agree on just over 30 (about 40%) and agree between 90 and 99% of the time on about three of four questions. There are very few things that economists don’t generally agree upon, and those appear to be issues where “little” research has been done by anyone. Where research has been done, economists seem to agree on pretty much everything. We also agree that price instruments are better than fuel economy standards (I’ve been saying that for years), that supply & demand factors drive oil prices, and “buy local” policies don’t save jobs, among other things. It’s interesting to me that when it comes to net benefits of the stimulus, our views dovetail with the public views (i.e., who knows). We previously posted about this important topic right here.